Alright, I must admit. I can be a little twisted and demented at times. No, no, not serial killer demented, more like twisted humour (well, maybe a serial eater). As such, I felt it would be a great idea to celebrate Easter. You might think that would mean going to church or do an Easter egg hunt with the kiddies. Nope. Didn't do either. Rather, my great idea was to eat the Easter bunny itself... Okay, if I've offended or turned you completely off, you can stop reading now. No, not that person in the bunny suit at the local mall handing out chocolate eggs. Instead, I was thinking along the lines of dining on rabbit at a restaurant. I bounced this idea off Kim and he being equally twisted agreed to join me. Mijune and Darina rounded out our dining party. Now with the main dish settled, we needed to find a place that actually serves rabbit. I really didn't do a lot of searching to tell you the truth. I've always had my eye on Bistrot Bistro and one look at their online menu yielded our desired protein. In fact, Darina really likes Bistrot Bistro and changed her plans to make it for dinner. That in itself is a fine vote of confidence for the place. I ended up arriving a tad early and was able to snag a parking spot right in front of another restaurant that I like - Dae Bak Bon Ga. In fact, there are several really good restaurants nearby on 4th Ave. Whenever a bunch of like-minded individuals meet, it's always chit chat and we never really get to ordering. It took us awhile since we wanted to make sure there were no duplicate dishes. Hey, we want to try as many different things as possible. This is probably the best way to get a read on a restaurant. We started off sharing the Baguette with Tapenade. Presented on a long wooden board, the crusty baguette was huge. 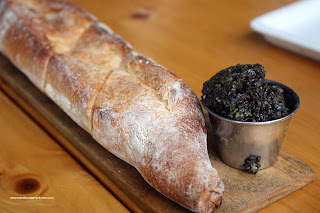 I'm not sure if the portion of tapenade was enough for so much bread. Despite a nice olive flavour, the tapenade would've benefited from more salt. It would've kicked up the flavour quotient a few notches. 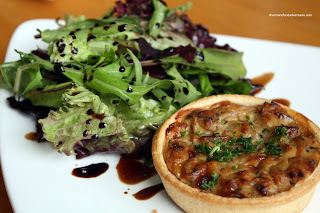 For myself, I had to try the Warm Caramelized Onion Maplewood Smoked Bacon Gruyere Tart. Hey, its got bacon! However, I didn't get a real sense of bacon in the tart since the sweetness of the onions was the dominant flavour. Don't get me wrong, I liked it. I just wanted more bacon. 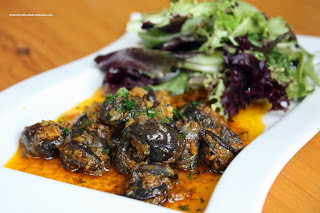 Darina got the Escargots in Butter Garlic and for $6.00, we felt that there were a good amount of snails. Although we could see the butter and the garlic, the dish wasn't all that flavourful. It was pleasant to eat; yet lack enough impact. It probably also needed a bit of salt. 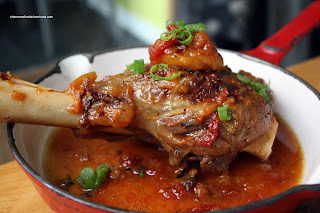 For my main, I went for the Lamb Shank with Spiced Apricots in Tomato White Wine. For me, I thought the meat was tender and had that slightly gelatinous/fattiness that is associated with braised lamb shank. Everyone else thought that the meat could've been braised a bit longer. In hindsight, I agree; yet the meat was far from being tough. I thought the sauce was "gentle" and was definitely a bystander to the gaminess of the lamb. This was not necessarily a bad thing since I like a strong lamb flavour. The one apricot was integral since it added a necessary sweetness. 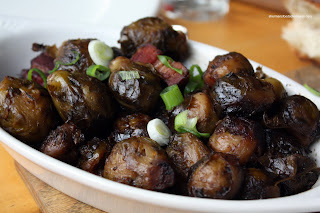 For my side dish, I added the Bacon Brussels Spouts. Hey, I love bacon! Fortunately, there was more bacon flavour here than the tart. In fact, there were nice gems of fatty bacon hidden between the soft; yet not mushy sprouts. I believe either balsamic or red wine was used in the preparation of this dish. Mijune went for another dish I was considering - Duck Confit Maca roni & Cheese. To me, that sounded really good. 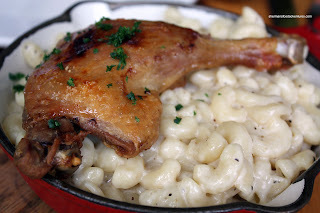 Somehow by the description, we were thinking that the duck would be in the mac 'n cheese, not on top of it. It could be that this was a way to retain the moisture and texture of the duck without drying it out. However, we felt that there needed to be actual duck flavour in the mac 'n cheese itself (maybe even use the duck fat itself in place of butter as suggested by Kim). As for the macaroni itself, it was a little on the softer side (not a big deal in this case). Personally, I liked the flavour of the mac 'n cheese; but Mijune would've liked more cheese itself. For her side dish, she went for the Braised Squash with Pearl Onions and Raisins. Interesting that she'd order this since the last time I had dinner with Mijune, she was expressing her disgust over the pureed squash at East is East. Well, this version is much better since the squash remained in whole pieces which were braised in a curry sauce. 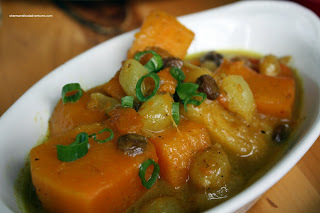 I liked this quite a bit since there was a nice marriage of sweetness from the squash and raisins with the slight spiciness of the curry. It seems that I order lamb all the time, which is quite predi ctable. 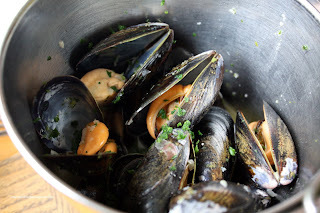 Well, somehow it seemed obvious that Darina would pick the Mussels with White Wine, Shallots and Parsley (she had it the last time we dined at La Brasserie). She added a side of Pomme Frites as well. The mussels were plump and fresh; yet there was a slight bitter aftertaste. Darina suggested that the wine may have not been cooked off enough. Whatever the case, we didn't think it detracted from the taste too much. As for the frites, they were outstanding. Resembling shoestring fries, they were crispy all the way through while maintaining a nice potato-ness. 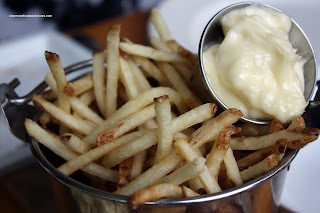 The side of house-made mayo provided a nice smooth addition to the crispy fries. Now here comes the main event! The Easter bunny! I know, it's sick... Anyways, Kim ordered the Rabbit Cooked in 2 Mustards, White Wine and Cream. By far, we felt that this was the most successful dish. And it's not because we were going for the twisted Easter theme either! 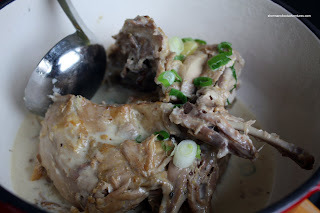 First of all, the rabbit (similar to chicken, everything does taste like chicken eh?) was tender and moist. Yet, the star of the show was the sauce. I tho ught it was delicately well-balanced. It was flavourful, with only hints of wine and mustard (not even sure if I tasted that much of it honestly). It was creamy without being heavy. In fact, we poured it on top of the remaining mac 'n cheese and it was fantastic! For his side, he went for the ever reliable Ratatouille. 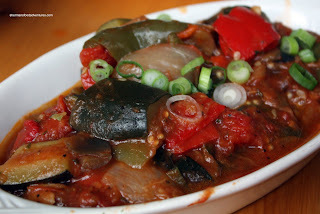 Full of the usual ingredients such as zucchini, peppers, eggplant, onions and tomatoes. For me, this was alright. Nothing against it per se, other than everything being quite mushy. I guess it was nothing exciting compared to other dishes. So solid ratatouille; but lost in the mix of everything else. At this point we were decently full from our meal. After all, the portions were quite good for the price. However, we were dining with Mijune, the queen of desserts. In fact, she already had the dessert menu sitting near her throughout the meal. Yah, she knows her priorities! Thus, we carefully planned out what desserts to order so we got to try a good variety. Wait, scratch that. In reality, Mijune just ordered the desserts for us and we took whatever was chosen. 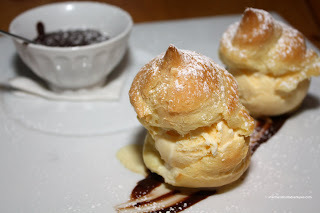 Arriving on a large plate were 2 decently-sized Profiteroles with Ice Cream and Chocolate Sauce. The profiteroles themselves were a desirable texture of a slight crustiness on the outside and airy tenderness on the inside. Although the ice cream sandwiched within them was pleasant tasting, it was a tad on the icy side. 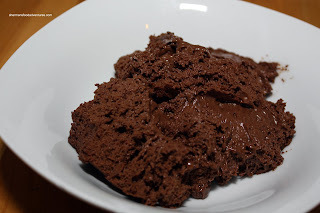 The chocolate sauce had a nice consistency and was indeed very chocolaty; yet it was a bit too sweet. Despite this, we felt the profiteroles were the hands down favourite of all the desserts we sampled. Impressively served table side from an extremely large mixing bowl, Kim's Chocolate Mousse ended up to be a very big portion. Look at the picture. That is easily 2-3 times larger than any other portion served at similar restaurants. Quite chocolaty with a slight bitter aftertaste, which is a good thing, the mousse was a tad sweet; yet not overly sweet. Kim tried to finish it all; but alas, it was a bit too much. Maybe Mijune would done better... As for my dessert, Mijune "helped" me order the Vanilla Bean Creme Brulee. Its appearance was quite appealing. One tap on the top with my spoon yielded the much desired hard caramelized sugar coating. Breaking into the custard and it was not exactly what I was envisioning. 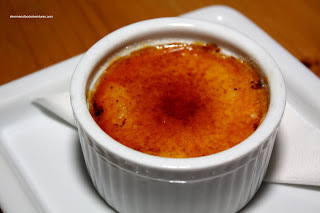 For me, I personally like my creme brulee to be a bit thicker. This was slightly runny. Despite this, we all thought it tasted quite good with a level of creaminess and understated sweetness (although the sugar topping provided plenty of sweetness). Although we could see the vanilla bean on the bottom, it didn't provide the "punch" we were looking for. 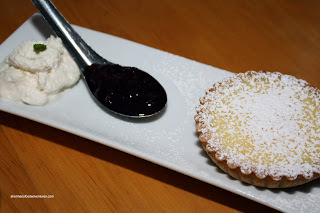 Darina ended up with the Lemon Tart which was served with berry compote and whipped cream. I thought that the lemon filling was a nice balance of tart and sweet. There was a good amount of buttery tart shell which was thick; yet easy to eat. It helped temper the tartness of the lemon which helped bring further balance. The desserts were a nice way to end a generally pleasant meal. The service was solid throughout the meal, although it was inevitable that they'd figure out what we were doing. It's hard to keep 2 DSLR's discreet in a small bistro! Also, thanks to the understanding couple beside us who had to put up with our picture taking as well. 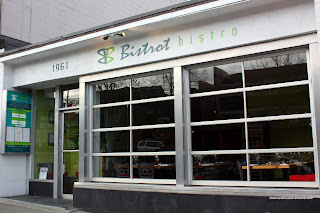 For the level of pricing combined with the overall food quality, Bistrot Bistro offers incredible value. In general, the food is well-portione d, properly prepared and made with care. Despite not taking advantage of the prix fixe menu (at an incredible $26.00), we still made it out of there with all the food we ate at $42.00 each inclusive. For a restaurant in trendy Kits, with solid service and great food, it's indeed a winner. I enjoyed our meal there. Thanks for organizing it. I think it's a good value for the quality of food offered there. I enjoyed your post, Sherman. Ironically, the rabbit was the best dish. oh, the poor bunny... :) i like the ways all of the dishes are presented except for the mousse. it's a blob! haha... sounds like it tasted really good though. the bread that you started with too... wow. why can't more places do this? Kimho, watch the movie Ratatouille, and all will be fine. Hate rabbit stew since my dormitory days. Great review. I'll definite try their lamb shank.